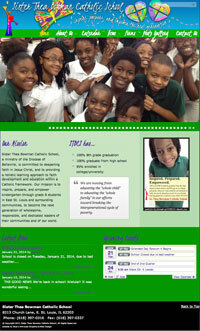 Sister Thea Bowman Catholic School is an elementary school in East St. Louis which focuses on arts education. This little school is working miracles in East St. Louis with 100% of their graduates completing high school and 95% attending college. We selected a bright, colorful palette for this website and used the students own artwork to decorate the header. You will fall in love with these kids when you see their smiling faces in the front page slider.